My friend Mayim Yael gave a really nice shout out to me on her blog, and I thought I should return the favor.Mayim hails from Des Moines, Iowa, and is hands down one of the coolest people I've ever met, and if you want to know whats up with art, music, and fashion, check out her blog. This girl has good taste. The tomahawks stop for nothing. Had a great weekend. Friday night, Wyldlife had a show at a house party in Pennsylvania. It was a crazy drive. It was down pouring, and we were driving on the side of the mountain, that just had the most insane curves. The party was so much fun, all the kids there were really cool, they danced and sang along to our songs. Without a doubt one of the best crowds we've played for. Thanks Ty for having us. House parties are really the best shows, because everyone just wants to have a good time, and enjoy themselves. 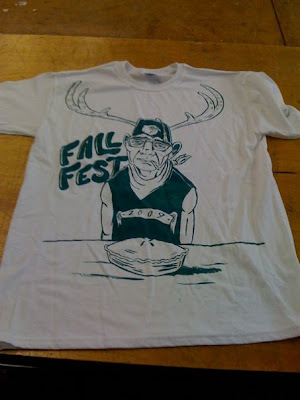 Saturday was Fall fest, and Mewithoutyou played. I haven't listened to them too much, but they put on an amazing show. The singer was just bouncing all over the stage, and the drummer was just banging on his set so hard. By far one of the best drummers I've seen. Now I've 300 shirts to iron tonight! SWEET! And I designed these suckas! I should mention that if you are looking to have some sick t-shirts, CD's, or posters printed, Alex,Ephraim, Manuel, and I, can design and print them for you, at the lowest price possible! I was on pandora today and this song came up, its so damn cool, I thought I'd share it with the world. My fifteen minutes of fame? Lord I hope not. guy:You guys here to see Jimmy Fallon? guy: You guys want to stand behind the roots and rock out when the musical guest plays? The musical guest was Christopher Cross, who I had never, ever heard of, and I like to think I have a pretty wide knowledge of popular music. I guess he would be categorized under "soft rock." It was music you'd hear in the supermarket late at night haha, but that made it all the more fun to dance to. So we ended up rocking out behind the legendary Christopher Cross and Michael McDonald(the surprise guest), haha, two very old "rock stars." You can see me directly behind Christopher Cross, rocking a leather jacket, my shades, and a sailors hat. Notice how at the end of the song, I motionlessly rock the Run DMC pose. I'm not sure how I get myself into these situations, but man am I glad I do. Its been a while since I posted some recent work so I decided to throw some up! One color screenprint I whipped up the night before our show at Purchase. Edition of 23. Acrylic on canvas. I haven't thought of a name for this one yet, and I'm not sure if I'm that into it haha. In my drawing seminar class we've been drawing the letter K. Sounds weird, but its really helping me tackle drawing perspective properly. I'm really starting to get into collage. 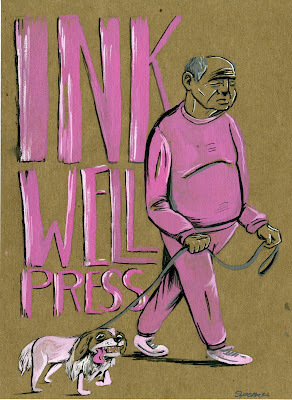 Ink, phone book paper, and spray paint on cardboard. The first couple of my painting classes, we were messing around with abstraction. Its not something I normally do, but it was alot of fun to just let go and experiment. I just finished designing and printing the shirts for the Dance conservatory. If you want one email Addison Reese at addison.reese@purchase.edu , but hurry because they're going fast! I've really been kicking myself for not bringing my camera along with me on my travels. This weekend Wyldlife played an acoustic set at the Balance hair salon in Jersey City. Our singer Dave works as the receptionist there and it was just a really cool place with alot of cool people. The best part was we got free haircuts after our set! If your in Jersey and need a haircut I recommend you hit them up. Later that evening we went to edge of the Hudson River and got to see the Manhattan skyline from New Jersey. It was breathtaking. I'm so pissed I didn't have my camera. After the Hudson we ended playing a show on top of a mini ramp in this old warehouse. It was seriously one of the coolest shows I've ever played. We set up on top of the ramp and were just rocking out while people were skating all around us. I almost got hit in the head with a stray board haha. 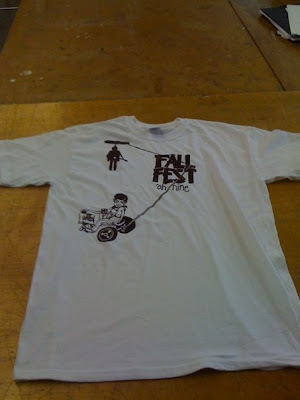 I've been working hard with the dream team (Alex, Manuel, and Ephraim) tryin to get the Purchase Fall fest shirts printed. I'm really stoked with how theyre coming out. I'll post some photos soon!